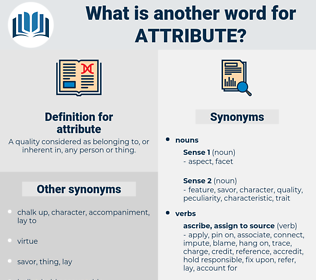 What is another word for attribute? A quality considered as belonging to, or inherent in, any person or thing. 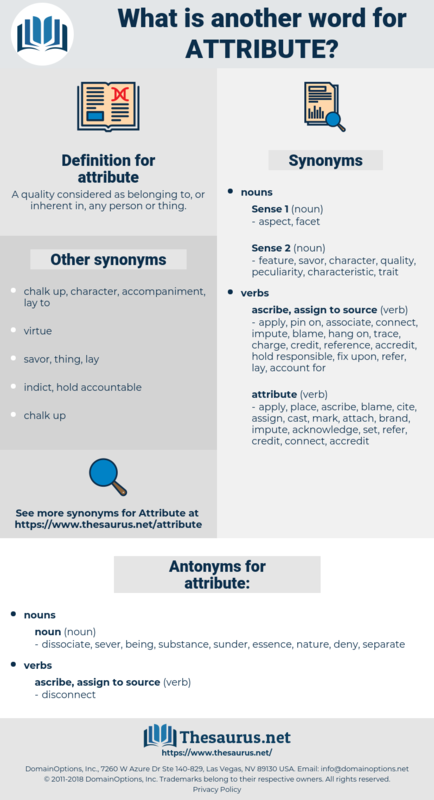 lay, allocating, impute, attribution, confer, designate, give, entrust, dedicate. dissociate, sever, being, substance, sunder, essence, nature, deny, separate. Mercy was an attribute uncommon in his family; of that all men can judge unto this day. But we find the prophecies concerning the Messiah to attribute to him very different works from these; nay, the very opposite. characteristic, feature of speech, lineament, feature, quality, character. form, common denominator, space, time, heritage, depth, trait, character, personality, ballast, cheer, uncheerfulness, shape, sunshine, ethos, infinite, human nature, thing, property, inheritance, quality, sunniness, state, eidos, cheerfulness.